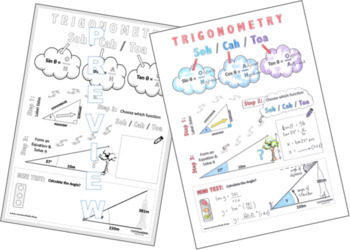 This is a color me in sheets or doodle notes on Trigonometry (SOH/CAH/TOA) to help pupils learn, revise and memorize key facts. 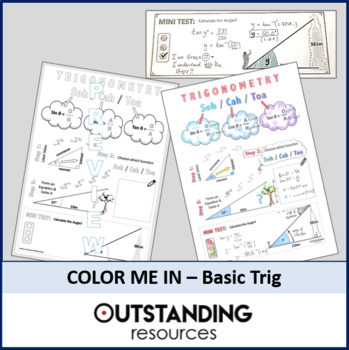 It works extremely well as a resource to give to the pupils while going through teaching slides as they can color, doodle or make extra notes. Research shows the benefits of this type of visual left-right cross brain activity. It is shown to help learners make connections, relax, retain key principles as well as being fun and enjoyable. It also means that students will have great notes to revise from and notes in exactly the way they learned it in class (also aiding their memory). 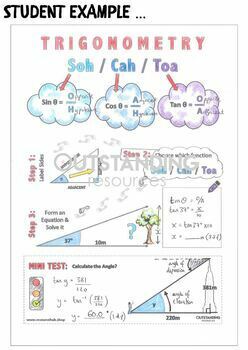 The sheet also includes a simple one question mini test for AFL and to further pupils confidence and assess understanding of the teaching part of the lesson. It includes an exemplar.